July 16, 2014 Springfield Public Schools broke ground on the New Sherwood Elementary School. 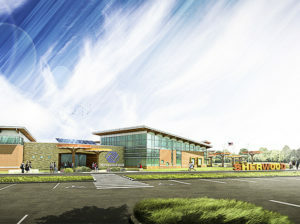 This new innovative school designed by Sapp Design Associates Architects will feature many firsts for the district and state of Missouri, including a unique partnership with the Boys and Girls Club. 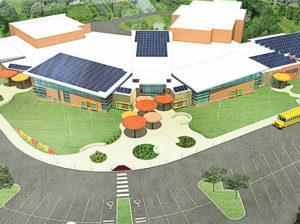 This will be the first school in the state of Missouri that has a dedicated BGC as part of the school building. This will allow students to easily attend the Boys and Girls Club after school without having to be bussed to a different location and provides additional funding for the school district creating a true win/win for everyone. The school will feature many collaboration spaces or “learning Parks” that promote an active learning environment along with brain friendly color schemes. The goal of the design is to create as much flexibility as possible so that no matter how educations changes over the years the school will be able to quickly adapt. The gymnasium of the new school will be designed to meet the structural requirements of a FEMA 361 Safe Room. The project is not receiving FEMA funding, but the school is committed to providing the safe room for the security of the kids and staff. The most cutting edge feature of this project is that it is Net Zero capable. A Net Zero building is one that uses very little energy and is powered completely by solar panels and or wind turbines. This project will not initially include solar nor wind power, but will be a very low energy consumer, so the future addition of solar and wind power will make it Net Zero and completely off the utility grid.